For other uses, see Thinking Out Loud (disambiguation). "Thinking Out Loud" is a song by English singer-songwriter Ed Sheeran, recorded for his second studio album, × (2014). It was written by Sheeran and Amy Wadge, and was produced by frequent collaborator Jake Gosling. It was released in the US on 24 September 2014, serving as the third single from the album. In the UK, the song spent 19 weeks within the top 40 before it peaked at No. 1 in early November 2014; it became Sheeran's second number-one single there. The single has also reached the top spot in Australia, Ireland, New Zealand, Denmark, the Netherlands, Slovakia and South Africa, and is also Sheeran's highest charting single in North America to date, peaking at No. 2 on both the US Billboard Hot 100 and the Canadian Hot 100. In June 2015, "Thinking Out Loud" became the first single to spend a full year in the UK top 40. In September 2015, it also became the seventh single to have achieved triple platinum in the UK during the 21st century. In October 2015, the song became the first to be streamed over 500 million times on Spotify, is also one of the most streamed songs in the UK and has been viewed more than 1.3 billion times on YouTube. "Thinking Out Loud" received nominations for Grammy Award for Record of the Year, Song of the Year and Best Pop Solo Performance at the 58th Grammy Awards, winning the latter two. On 10 August 2016, it was announced that Sheeran was getting sued by the family of Ed Townsend for copyright infringement, who claim that "Thinking Out Loud" plagiarises elements of Marvin Gaye's "Let's Get It On". Sheeran wrote "Thinking Out Loud" with Amy Wadge (pictured), an English singer-songwriter based in Wales. Sheeran wrote "Thinking Out Loud" with Amy Wadge, a Wales-based singer-songwriter. He met Wadge when he was 17 years old and they had since written several songs together. Of these, five songs composed the extended play Songs I Wrote with Amy, which Sheeran independently released on 4 April 2010. Wadge also co-wrote the song "Gold Rush", a track on the deluxe version of Sheeran's debut album, + (2011). In February 2014, Wadge visited Sheeran in his house for a "chilling-out time". Around that time, Sheeran's second studio album, ×, was nearly completed. Wadge revealed that her visit was not supposed to be a songwriting session. While Sheeran was taking a shower, Wadge played a few chords on a guitar. The tune caught the attention of Sheeran and he ran downstairs. Sheeran suggested working with the tune, but only after returning home from dinner, work began. The melody developed from a simple riff. According to Sheeran, he composed the melody on a guitar in a manner which was "very Van-like", referring to Van Morrison. The Irish musician has been an inspiration to Sheeran since a young age, and Sheeran wanted to capture that vibe when he composed the song. In the kitchen, Sheeran and Wadge began writing the song at 2:00 am on 4 February 2014, and completed it in 20 minutes. According to Wadge, the lyrical content resulted from her and Sheeran's talking about "everlasting love", inspired by the circumstances relevant at that time. Sheeran also revealed that the lyrics were inspired by his then-girlfriend, Athina Andrelos, whom Sheeran met in early 2014. Sheeran would later explain that he wrote the song "in a relationship at a really, really happy point". Immediately after writing, Sheeran recorded the song on his phone. He was keen to include "Thinking Out Loud" on the second album. He properly recorded the song the following day at the Sticky Studios, a recording facility located in the small Surrey village of Windlesham, and informed Wadge of its inclusion on the album. It became the last song recorded for the album. For "Thinking Out Loud", Sheeran sought the assistance of Jake Gosling, who produced much of his debut album and had earlier contributed tracks, four of which appear on the standard version of the second album. A 28-second sample of "Thinking Out Loud", a romantic blue-eyed soul ballad. Its composition has a strong influence of Marvin Gaye's 1973 hit "Let's Get It On". "Thinking Out Loud" is a romantic ballad with blue-eyed soul influences. Sheeran referred to it as a "walking down the aisle song". In the lyrics, Sheeran reflects on "getting older and fidelity and love in a fairly conventional context", according to Eric Clarke, professor of music at University of Oxford. The song was composed in the key of D major with a tempo of 79 beats per minute. Sheeran's vocals range from A2 to B4. In the mix, Sheeran's voice is "unusually" loud over the instruments, which, for Mike Senior of the music technology magazine, Sound on Sound, is "surprisingly rare" in contemporary records. Senior analysed the vocal elements in which he found that, in spite of several notes sung off pitch, "the overall framework of the vocal remains fundamentally in tune". Journalists noted similarities between "Thinking Out Loud" and "Let's Get It On", a 1973 single by soul musician, Marvin Gaye. Andrew Unterberger of Spin wrote that "the gently loping four-note bass pattern and crisp '70s soul drums absolutely smack of the Gaye classic, as do the embrace-insistent lyrics and general candlelit-bedroom feel". Jason Lipshutz of Billboard called it a "sleek update" of the classic. Prior to the album release, Sheeran debuted "Thinking Out Loud" on 24 May 2014 by performing it live on the British music television show, Later... with Jools Holland. The debut followed the release of the video accompaniment to "Sing", the album's lead single. "Thinking Out Loud" was immediately perceived as having contrast to "Sing", which is a "high-energy funk/R&B-infused song". "Thinking Out Loud" became available on 18 June 2014 as an "instant grat" download for consumers who pre-ordered × on the iTunes Store. It served as a promotional single from ×, which was released two days later. On the standard version of the album, "Thinking Out Loud" is the next-to-last track, the last being "Afire Love". "Thinking Out Loud" was initially serviced to Australian radio on 14 August 2014 and later released on 24 September 2014. It served as the third of five singles released from the album; it followed the songs, "Sing" and "Don't", the first and second single respectively. According to Sheeran, no one from his record label wanted to release "Thinking Out Loud" as a single, favouring over "Photograph" as the "big song". "Photograph" was supposed to be the main single, but when "Thinking Out Loud" spent several weeks within the top 20 on the UK Singles Chart albeit not receiving rotation, the latter song was kept as the third single. "Photograph" was later released as the fifth and final single. The song was issued on 7" vinyl exclusively as part of the Black Friday Record Store Day, which was celebrated on 28 November 2014. The vinyl record included, as a B-side, the live version of "I'm A Mess" which Sheeran performed at the Lightship 95 studio. Emil Nava directed the video accompaniment to the single. 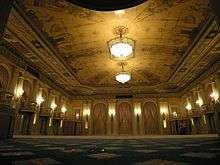 Most of it was filmed in the Crystal Ballroom at the Millennium Biltmore Hotel in Los Angeles, California. The video was shot continuously using a 16 mm film camera. Unlike Sheeran's earlier videos, where he assume a low profile, he took the lead role on "Thinking Out Loud". In the video, Sheeran executes a ballroom dance with Brittany Cherry, a contestant from the televised American dance competition, So You Think You Can Dance. The routine was choreographed by Nappytabs and with training help from Paul Karmiryan. While on concert tour, Sheeran spent five hours a day for three weeks to practice with Cherry. The video was released on 8 October 2014. After first 24 hours, the video had over 2.7 million views on video-sharing website, YouTube. As of November 2016, it has over 1.39 billion views, making it the 19th most viewed video on the site. The music video received four nominations at the 2015 MTV Video Music Awards including Video of the Year and Best Male Video. On 26 October 2014, Sheeran performed the song on third live results show of series 11 of The X Factor. He also performed it on 9 November 2014 in the 2014 MTV Europe Music Awards. Sheeran also performed the song as a special guest at The Voice's live finale on 16 December 2014. Furthermore, Sheeran performed the track on the Christmas Special of The Jonathan Ross Show on 20 December 2014. He also performed the song at the 57th Annual Grammy Awards on 8 February 2015 along with John Mayer, Questlove, Adam Blackstone, and Herbie Hancock. Sheeran performed "Thinking Out Loud" on 13 April 2015 results show of the second series of The X Factor in New Zealand. Sheeran also performed "Thinking Out Loud" at the Victoria's Secret Fashion Show 2014. On 26 December 2015, Sheeran released a Gaelic version of "Thinking Out Loud" for the upcoming Irish album, CEOL 2016. Lauren Murphy of The Irish Times noted that the "injection of blue-eyed soul" on the song is "enjoyable", and that it "makes Sheeran's aptitude for melody difficult to dismiss". Jim Beviglia of the American Songwriter thought that although "tidy", "Thinking Out Loud" comes "toothless" compared with the "daring confessionals" Sheeran made on the other songs. The Washington Post writer, Allison Stewart, has hailed the song as "a blatant and mercilessly effective bid for 'I'll Be'-style wedding-song immortality". Billboard magazine's Jason Lipshutz, commented that Sheeran "pushes this bold stab at romance past its sappiest moments, and ends the album on a likable note". Jamieson Cox of Time wrote that "the album’s greatest moment by a country mile is relegated to its penultimate slot", referring to "Thinking Out Loud". "Thinking Out Loud" topped several charts in Europe, Oceania and South Africa, and reached the top ten in several other countries in the Northern America (see Weekly charts below). Upon the album's release, the single debuted at number 26 on the UK Singles Chart. On 2 November 2014, "Thinking Out Loud" topped the UK Singles Chart in its 19th week in the Top 40, breaking the record for the longest ascent to number one. In the week ending 27 June 2015, it had spent a record consecutive 52 weeks (or a full year) inside the top 40. Around the same time, the single had accumulated 1.65 million combined sales and streams; it became one of the 161 million-selling singles and the 26th best-selling of the 2010s in the UK. On 18 September 2015, the British Phonographic Industry certified the single triple platinum for combined sales (including streaming points) of 1,800,000 units. In the US, "Thinking Out Loud" peaked at number two on the all-encompassing chart Billboard Hot 100; the single became Sheeran's highest charting single to date. It remained the runner-up spot for eight consecutive weeks, a chart feat last held in 2004. "Thinking Out Loud" was kept off the top spot by Uptown Funk", although it outperformed the latter song for a week in February 2015 on the Billboard Digital Songs. On other specific US charts, "Thinking Out Loud" reached number one on the Billboard Adult Pop Songs for the week ending 21 February 2015, marking Sheeran's first. For the week ending 21 March 2015, "Thinking Out Loud" held the top position on the Billboard Pop Songs, Adult Pop Songs, and Adult Contemporary charts, becoming the fourth song in history to lead all three adult charts simultaneously. "Thinking Out Loud" is Sheeran's best-selling song in the United States, with 4,300,000 copies sold as of July 2015. In the UK, Sheeran's native country, "Thinking Out Loud" claimed the record for the most streams in a single week in December 2014. The track accumulated over 1,638,000 streams, and subsequently achieved a personal best of 1,850,000 streams in the week ending 21 December 2014. This record has since been broken by several songs. In April 2015, the song ranked as the most popular based on the 2.8 million sleep-themed playlists created by Spotify users. Sleep is one of the company's most popular categories that, according to Spotify, "people also use for general relaxation and to help themselves unwind". The Guardian columnist Tim Dowling suggested that the report indicated "very popular, slightly mellow songs that keep cropping up on sleep playlists" but not a list of a "carefully curated journey to unconsciousness". In October 2015, "Thinking Out Loud" set the record of most streams of a song on Spotify, having accumulated over 500 million streams. The company created the "Sheerio Index", an interactive graphic map which showed where Sheeran was most popular. The color-based map indicated that Sheeran was most popular in Denmark. It was surpassed a month later by "Lean On", a song by Major Lazer and DJ Snake featuring MØ. On the April 28, 2015 episode of The Tonight Show Starring Jimmy Fallon, actor Jeremy Renner, known for his role as Hawkeye in the Avengers movies, performed on piano and sang a song captioned by Fallon's show on YouTube as "Hawkeye Sings About His Super Powers." While not parodying Sheeran's lyrics, it is sung to the same tune. The lyrics suggest that Hawkeye feels defensive compared with the other Avengers: "But listen, I've got powers too; they're pretty sweet. / I promise I can do so much more than just archery ... / I can open a pickle jar. / I'm friggin' Hawkeye. / Maybe I'm as super as they are." On 10 August 2016, it was revealed that the family of Ed Townsend, who wrote Marvin Gaye's "Let's Get It On" was suing Ed Sheeran saying "the melodic, harmonic, and rhythmic compositions of 'Thinking' are substantially and/or strikingly similar to the drum composition of 'Let's'." The song was featured in the 2016 film Me Before You. It was also covered in the film Bridget Jones's Baby. 1 2 Farragher, Mike (8 January 2015). "Irish Central - Ed Sheeran X". IrishCentral. Retrieved 22 September 2015. ↑ "Ed Sheeran sued for allegedly copying Marvin Gaye classic Let's Get It On". The Guardian. 10 August 2016. Retrieved 11 August 2016. ↑ "Video: Ed Sheeran performs Thinking Out Loud". The Daily Telegraph. 10 June 2014. Retrieved 22 September 2015. 1 2 Maloney, Devon (24 May 2014). "Ed Sheeran Debuts New Song 'Thinking Out Loud'". Billboard. Retrieved 25 September 2015. ↑ Smith, Caitlin (2 May 2014). "Ten things we learnt about Ed Sheeran on his visit". 3 News. Retrieved 22 June 2014. ↑ Gibsone, Harriet (1 January 2015). "Ed Sheeran: from boy next door to biggest-selling artist of the year". The Guardian. Retrieved 2 November 2015. ↑ "Thinking Out Loud by Ed Sheeran - Digital Sheet Music". Musicnotes.com. Retrieved 20 February 2015. 1 2 Senior, Mike (March 2015). "The Mix Review: Commercial Productions Analysed". Sound on Sound. Retrieved 25 September 2015. ↑ Unterberger, Andrew (11 March 2015). "'Blurred Lines' Isn't Even the Biggest Marvin Gaye Ripoff This Decade". Spin. Retrieved 24 September 2015. 1 2 Lipshutz, Jason (23 June 2014). "Ed Sheeran, 'x': Track-By-Track Review". Billboard. Retrieved 30 June 2014. ↑ Legaspi, Althea (24 May 2014). "Watch Ed Sheeran Debut His Romantic New Ballad 'Thinking Out Loud'". MTV. Retrieved 25 September 2015. ↑ Accardi, Kristin. "Ed Sheeran Talks "Photograph," His Music Being a Turnoff For His Family + Ed "Goes To Prom" with Shoboy". 923amp.cbslocal.com. Retrieved 25 September 2015. ↑ Walsh, Jason (27 October 2014). "Neil Young, Kinks, Morricone Among Record Store Day Vinyl Highlights". Acoustic Guitar. Retrieved 25 September 2015. 1 2 "Ed Sheeran: Thinking Out Loud/I'm A Mess". Record Store Day. Retrieved 4 November 2014. ↑ Lindner, Emilee (7 October 2014). "Who Knew Ed Sheeran Could Dance? Watch 'Thinking Out Loud' Now". MTV. Retrieved 6 November 2015. 1 2 Parker, Lyndsey (9 October 2014). "Sheeran Busts Out the Ballroom Moves in 'Thinking Out Loud' Video". Rolling Stone. Retrieved 4 November 2015. ↑ "Ed Sheeran - Thinking Out Loud". YouTube. Retrieved 12 October 2015. ↑ "Most Viewed Videos of All Time (Over 100 million views)". YouTube. Retrieved 12 October 2015. ↑ Stutz, Colin (21 July 2015). "2015 MTV Video Music Awards Nominees Revealed: Taylor Swift, Kendrick Lamar, Ed Sheeran & More". Billboard. Retrieved 6 November 2015. ↑ Finbow, Katy (19 October 2014). "X Factor week 3 is Movie Night: Ed Sheeran and OneRepublic performing". Digital Spy. Hearst Magazines UK. Retrieved 19 October 2014. ↑ Lipshutz, Jason (9 November 2014). "Ed Sheeran Brings 'Thinking Out Loud' To MTV EMAs". Billboard. Retrieved 9 November 2014. ↑ McRady, Rachel (9 February 2015). "Ed Sheeran, John Mayer's "Thinking Out Loud" Grammys Performance Will Make You Swoon: Watch Now!". US Magazine. Retrieved 9 February 2015. ↑ Pudney, Harriet (13 April 2015). "X Factor recap: Joe Irvine and Finlay Robertson eliminated". Stuff.co.nz. Archived from the original on 13 April 2015. ↑ "Ed Sheeran Performs 'Thinking Out Loud' at the 2014 Victoria's Secret Fashion Show [VIDEO]". 9 December 2014. Retrieved 19 May 2015. ↑ "Listen: Ed Sheeran records his song "Thinking Out Loud" in Irish". Irish Central. 26 December 2015. Retrieved 26 December 2015. ↑ Murphy, Lauren (20 June 2014). "Ed Sheeran: x". The Irish Times. Retrieved 25 September 2015. ↑ Beviglia, Jim (23 June 2014). "Ed Sheeran: X". American Songwriter. Retrieved 25 September 2015. ↑ Stewart, Allison (23 June 2014). "Sam Smith and Ed Sheeran - young Brits in search of love and slightly better songs". The Washington Post. Retrieved 24 September 2015. ↑ Cox, Jamieson (31 May 2014). "Review: Ed Sheeran Multiplies His Appeal on x". Time. Retrieved 3 November 2015. ↑ Moss, Liv (2 November 2014). "Ed Sheeran's Thinking Out Loud breaks chart record for longest climb to Number 1 ever!". Official Charts Company. Retrieved 2 November 2014. ↑ Copsey, Rob (22 June 2015). "Ed Sheeran's Thinking Out Loud becomes first single ever to spend one year inside the Top 40". Official Charts Company. Retrieved 22 June 2015. ↑ Copsey, Rob (22 June 2015). "Ed Sheeran's Thinking Out Loud becomes first single ever to spend one year inside the Top 40". Official Charts Company. Retrieved 4 November 2015. ↑ Trust, Gary (11 March 2015). ""Uptown Funk" spends 10th week at No. 1, while Ed Sheeran spends eighth week at No. 2". Billboard. Retrieved 2 November 2015. ↑ "Bruno Mars gains longest Hot 100 reign, Taylor Swift hits top 10". Billboard. 2015-02-18. Retrieved 2015-03-04. ↑ Trust, Gary (9 February 2015). "Chart Highlights: Taylor Swift, Ed Sheeran & More Score New No. 1s". Billboard. Prometheus Global Media. Retrieved 9 March 2015. ↑ Trust, Gary (9 March 2015). "Chart Highlights: 'Loud' & Proud, Ed Sheeran Tops All Three Pop, Adult Airplay Charts". Billboard. Prometheus Global Media. Retrieved 9 March 2015. 1 2 Lipshutz, Jason (31 July 2015). "Ed Sheeran's Still on the Rise: 'X' Yields Fourth Top 20 Hit". Billboard. Retrieved 1 August 2015. ↑ Moss, Liv (7 December 2014). "Ed Sheeran returns to Official Singles Chart Number 1". Official Charts Company. Retrieved 7 December 2014. ↑ Dredge, Stuart (7 September 2015). "Spotify data reveals boom in sleep and relaxation albums". The Guardian. Retrieved 2 November 2015. ↑ "Spotify Says Ed Sheeran Dominates the World's Sleep Playlists". Billboard. 13 April 2015. Retrieved 3 November 2015. ↑ Angel, Meredith (16 April 2015). "Ed Sheeran puts Spotify users to sleep the most". Daily News. New York. Retrieved 21 August 2015. ↑ Dowling, Tim (14 April 2015). "Spotify's top 20 songs to help you sleep: we put them to the test". The Guardian. Retrieved 21 August 2015. 1 2 Weiner, Natalie (12 October 2015). "Ed Sheeran's 'Thinking Out Loud' the First Song to Hit 500 Million Spotify Streams". Billboard. Retrieved 12 October 2015. ↑ "Leaning power: Spotify names its most streamed track of all time". The Guardian. 12 November 2015. Retrieved 12 November 2015. ↑ Renner, Jeremy (April 28, 2015). Hawkeye Sings About His Super Powers (Ed Sheeran "Thinking Out Loud" Parody). The Tonight Show Starring Jimmy Fallon. Retrieved December 21, 2015. ↑ Izundu, Chi Chi (10 August 2016). "Ed Sheeran sued over claims he's ripped off a Marvin Gaye song". BBC. Retrieved 10 August 2016. ↑ "Thinking Out Loud (2track)". Amazon.com. Retrieved 4 November 2015. ↑ "Thinking Out Loud (Alex Adair Remix)". Amazon.com. Retrieved 4 November 2015. ↑ "Thinking Out Loud Australian Exclusive EP". Amazon.com. Retrieved 4 November 2015. ↑ "Australian-charts.com – Ed Sheeran – Thinking Out Loud". ARIA Top 50 Singles. ↑ "Austriancharts.at – Ed Sheeran – Thinking Out Loud" (in German). Ö3 Austria Top 40. ↑ "Ultratop.be – Ed Sheeran – Thinking Out Loud" (in Dutch). Ultratop 50. ↑ "Ultratop.be – Ed Sheeran – Thinking Out Loud" (in French). Ultratop 50. 1 2 "Top 100 Billboard Brasil - weekly". Billboard Brasil. 15 June 2015. Retrieved 16 June 2015. ↑ "The Bulgarian Association of Music Producers". Bulgarian Association of Music Producers. Retrieved 5 January 2015. ↑ "Ed Sheeran – Chart history" Canadian Hot 100 for Ed Sheeran. ↑ "Ed Sheeran – Chart history" Billboard Canada AC for Ed Sheeran. Retrieved 2 March 2015. ↑ "Ed Sheeran – Chart history" Billboard Canada CHR/Top 40 for Ed Sheeran. Retrieved 6 February 2015. ↑ "Ed Sheeran – Chart history" Billboard Canada Hot AC for Ed Sheeran. Retrieved 6 February 2015. ↑ "ČNS IFPI" (in Czech). Hitparáda – Radio Top 100 Oficiální. IFPI Czech Republic. Note: insert 20154 into search. Retrieved 28 January 2015. ↑ "ČNS IFPI" (in Czech). Hitparáda – Digital Top 100 Oficiální. IFPI Czech Republic. Note: insert 20153 into search. Retrieved 23 January 2015. ↑ "Danishcharts.com – Ed Sheeran – Thinking Out Loud". Tracklisten. ↑ "Ed Sheeran – Chart history" Billboard Euro Digital Songs for Ed Sheeran. ↑ "Ed Sheeran: Thinking Out Loud" (in Finnish). Musiikkituottajat – IFPI Finland. ↑ "Lescharts.com – Ed Sheeran – Thinking Out Loud" (in French). Les classement single. ↑ "Offiziellecharts.de – Ed Sheeran – Thinking Out Loud". GfK Entertainment Charts. ↑ "Archívum – Slágerlisták – MAHASZ" (in Hungarian). Single (track) Top 40 lista. Magyar Hanglemezkiadók Szövetsége. ↑ "Angrezi Top 20". The Times of India - Radio Mirchi. Archived from the original on 13 February 2015. Retrieved 13 February 2015. ↑ "Chart Track: Week 44, 2014". Irish Singles Chart. ↑ "Ed Sheeran – Thinking Out Loud Media Forest". Israeli Airplay Chart. Media Forest. Retrieved 23 November 2014. ↑ "Italiancharts.com – Ed Sheeran – Thinking Out Loud". Top Digital Download. ↑ "The Official Lebanese Top 20 - Charts". Retrieved 21 February 2015. ↑ "Charts monitorLATINO". Retrieved 3 April 2015. ↑ "Nederlandse Top 40 – Ed Sheeran search results" (in Dutch) Dutch Top 40. ↑ "Dutchcharts.nl – Ed Sheeran – Thinking Out Loud" (in Dutch). Single Top 100. ↑ "Charts.org.nz – Ed Sheeran – Thinking Out Loud". Top 40 Singles. ↑ "Norwegiancharts.com – Ed Sheeran – Thinking Out Loud". VG-lista. ↑ "Listy bestsellerów, wyróżnienia :: Związek Producentów Audio-Video". Polish Airplay Top 100. Retrieved 7 April 2015. ↑ "Portugal Digital Songs - Peak". Billboard. Retrieved 25 January 2015. ↑ "Media Forest - Know You Are ON AIR". mediaforest.ro. ↑ "Archive Chart: 2014-11-08". Scottish Singles Top 40. Retrieved 30 June 2014. ↑ "SNS IFPI" (in Slovak). Hitparáda – Radio Top 100 Oficiálna. IFPI Czech Republic. Note: insert 20153 into search. ↑ "SNS IFPI" (in Slovak). Hitparáda – Singles Digital Top 100 Oficiálna. IFPI Czech Republic. Note: insert 201450 into search. Retrieved 16 December 2014. ↑ "EMA Top 10 Airplay: Week Ending 2015-01-27". Entertainment Monitoring Africa. Retrieved 16 September 2015. ↑ "Spanishcharts.com – Ed Sheeran – Thinking Out Loud" Canciones Top 50. ↑ "Swedishcharts.com – Ed Sheeran – Thinking Out Loud". Singles Top 100. ↑ "Swisscharts.com – Ed Sheeran – Thinking Out Loud". Swiss Singles Chart. ↑ "Archive Chart: 2014-11-08" UK Singles Chart. Retrieved 19 October 2014. ↑ "Ed Sheeran – Chart history" Billboard Hot 100 for Ed Sheeran. ↑ "Ed Sheeran – Chart history" Billboard Adult Alternative Songs for Ed Sheeran. ↑ "Ed Sheeran – Chart history" Billboard Adult Contemporary for Ed Sheeran. ↑ "Ed Sheeran – Chart history" Billboard Adult Pop Songs for Ed Sheeran. ↑ "Ed Sheeran – Chart history" Billboard Dance/Mix Show Airplay for Ed Sheeran. ↑ "Ed Sheeran – Chart history" Billboard Latin Airplay for Ed Sheeran. ↑ "Ed Sheeran – Chart history" Billboard Latin Pop Songs for Ed Sheeran. ↑ "Ed Sheeran – Chart history" Billboard Pop Songs for Ed Sheeran. ↑ "Ed Sheeran – Chart history" Billboard Rhythmic Songs for Ed Sheeran. ↑ "Charts monitorLATINO USA". Retrieved 28 February 2015. ↑ "Record Report - Pop General". Record Report. 14 February 2015. Retrieved 17 February 2015. ↑ "Record Report - Top Anglo". Record Report. 14 February 2015. Retrieved 17 February 2015. ↑ "End of Year Charts – ARIA Top 100 Singles 2014". ARIA Charts. Australian Recording Industry Association. Retrieved 1 February 2015. ↑ "Top 100 Single-Jahrescharts". GfK Entertainment (in German). offiziellecharts.de. Retrieved 10 August 2015. ↑ "IRMA - Best of Singles". IRMA Charts. Irish Record Music Association. Retrieved 30 December 2014. ↑ "FIMI - Classifiche Annuali 2014 "TOP OF THE MUSIC" FIMI-GfK: un anno di musica italiana" (in Italian). Federazione Industria Musicale Italiana. Retrieved 14 January 2015. ↑ "Top Selling Singles of 2014". Recorded Music NZ. Retrieved 27 December 2014. ↑ Copsey, Rob (31 December 2014). "The Official Top 100 Biggest Songs of 2014 revealed". Official Charts Company. Retrieved 31 January 2014. ↑ "ARIA Charts - End of Year Charts - Top 100 Singles 2015". Australian Recording Industry Association. Retrieved 6 January 2016. ↑ "Jaaroverzichten 2015". Ultratop. Ultratop & Hung Medien. Retrieved 26 December 2015. ↑ "Canadian Hot 100 Year End 2015". Billboard. Prometheus Global Media. Retrieved 9 December 2015. ↑ "Top 100 Single-Jahrescharts". GfK Entertainment (in German). offiziellecharts.de. Retrieved 6 January 2016. ↑ "Israel Airplay Year End 2015". Retrieved January 5, 2016. ↑ "Classifiche "Top of the Music" 2015 FIMI-GfK: La musica italiana in vetta negli album e nei singoli digitali" (in Italian). Federazione Industria Musicale Italiana. Retrieved January 13, 2016. ↑ "Top Selling Singles of 2015". Recorded Music NZ. Retrieved 25 December 2015. ↑ "Airplay – podsumowanie 2015 roku" (in Polish). Polish Society of the Phonographic Industry. Retrieved December 30, 2015. ↑ "The Official Top 40 Biggest Songs of 2015 revealed". Retrieved 4 January 2016. ↑ "Hot 100 Songs Year End 2015". Billboard. Prometheus Global Media. Retrieved 9 December 2015. ↑ "Adult Contemporary Songs Year End 2015". Billboard. Prometheus Media Group. Retrieved 9 December 2015. ↑ "Adult Pop Songs Year End 2015". Billboard. Prometheus Media Group. Retrieved 9 December 2015. ↑ "Pop Songs Year End 2015". Billboard. Prometheus Media Group. Retrieved 13 December 2015. ↑ "ARIA Charts – Best of all time chart – Top 1000 Singles". Retrieved 1 January 2014. ↑ "Best of All Time – Singles". Charts.org.nz. Hung Medien. Retrieved 23 May 2014. ↑ "CHART WATCH #378". auspOp. 23 July 2016. Retrieved 23 July 2016. ↑ "Ultratop − Goud en Platina – 2015". Ultratop & Hung Medien / hitparade.ch. Retrieved 3 April 2015. ↑ "Canadian single certifications – Ed Sheeran – Thinking Out Loud". Music Canada. 15 May 2015. ↑ "Gold-/Platin-Datenbank (Ed Sheeran; 'Thinking Out Loud')" (in German). Bundesverband Musikindustrie. ↑ "..:Certificaciones Mensuales 2015:..". Asociación Mexicana de Productores de Fonogramas y Videogramas. Facebook. 11 April 2015. Retrieved 11 April 2015. ↑ "New Zealand single certifications – Ed Sheeran – Thinking Out Loud". Recorded Music NZ. 3 July 2015. ↑ "ED SHEERAN - Thinking out Loud". ED SHEERAN - Thinking out Loud - Elportaldemusica.es: Novedades y Listas Oficiales de Ventas de Música en España. ↑ "Ed Sheeran - Thinking Out Loud" (in Swedish). Grammofon Leverantörernas Förening. Retrieved 31 October 2014. ↑ "The Official Swiss Charts and Music Community: Awards (Ed Sheeran; 'Thinking Out Loud')". IFPI Switzerland. Hung Medien. ↑ Copsey, Rob (25 March 2016). "The Top 40 biggest British hits of the decade so far revealed". Official Charts Company. Retrieved 25 March 2016. "You Need Me, I Don't Need You"
"Lay It All on Me"
Thaddis "Kuk" Harrell, Beyoncé Knowles, Terius Nash & Christopher Stewart – "Single Ladies (Put a Ring on It)"
Dave Haywood, Josh Kear, Charles Kelley & Hillary Scott – "Need You Now"
Adele Adkins & Paul Epworth – "Rolling in the Deep"
Jack Antonoff, Jeff Bhasker, Andrew Dost & Nate Ruess – "We Are Young"
Joel Little & Ella Yelich O'Connor – "Royals"
Ed Sheeran & Amy Wadge – "Thinking Out Loud"